Tags: Cipher, Larissa Ione, What's on pre-order? With every new book Larissa Ione releases for this series, I wish longingly for a full length novel. But I guess in the mean time I will just have to do with a novella to keep me warm. This world has me addicted and a new wave to this series is supposed to start up since most of the main characters have had their story. Until then, we get secondary characters to tide us over. Ooo! I hope it is a good one when you get it! I got it this morning and now I can’t find time to read! One of these days, I will get around to her Demonica series on my shelf. I know what you mean about wanting a novel-length one. You should! Some are quite funny, some quite violent and funny and some are just violent. In general, the world she builds just needs it all. 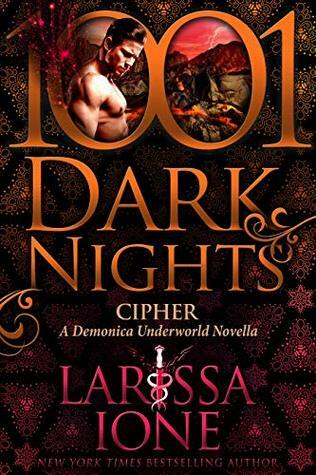 I saw she has a full length novel coming out revisiting one of her 1001 Dark Nights characters. I can’t wait! I just got hooked on the demonica series and enjoying it so far for sure!!! Hope you love this novella. I love almost anything this woman decides to write. I don’t know how I found her years ago, but I am glad I did. And she was so nice when I met her a ROR2018. Mmm, I must check out Storm Cursed, but I am so far behind on reading. I really wanted to push my reading up, but I have way to many things going on and haven’t been able to get ahead. I really need to get caught up on Demonica Underworld series. Enjoy. Ohhh, you will love it and then get mad that all you get are novellas for a while, lol. I can’t wait for the next full length novel which I saw was being released, but can’t find out when since I can’t find where I saw it. Guess I just need to search the author’s website.